As I was walking to OPEN Ealing this morning I noticed part of Dean Gardens was cordoned off. Apparently there was a fight overnight/early morning and one person has been taken to hospital and another arrested. 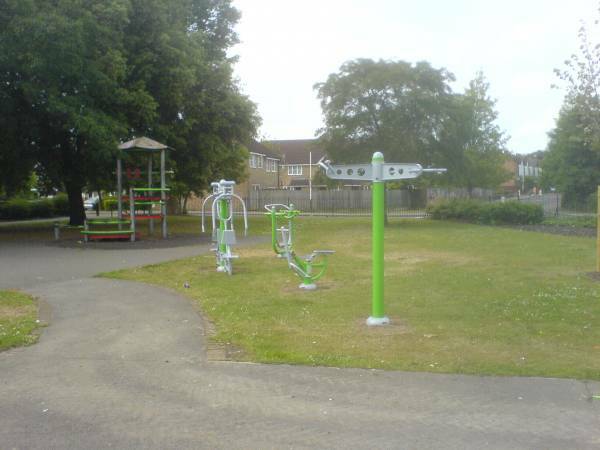 The fight looks to have taken place in clear vision of one of the newly installed CCTV cameras. It’s an interesting question as to whether the newly installed CCTV acts as a deterrent or as a means of identifying and apprehending offenders? Not long after this there was an armed robbery at the NatWest Bank on the corner of the Lido Junction. Seems the robbers got away with some cash. 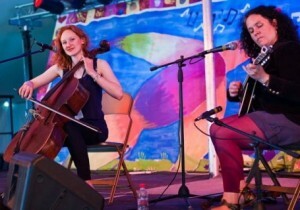 OPEN Ealing, a new arts centre and creative arts platform in West Ealing, is proud to present folk musicians, Laura Victoria and Sarah-Jane Miller for a free lunchtime concert on Friday 1st June, from 12.30 to 1.30pm. United by their interests of exploring and interpreting traditional folk materials both Sarah-Jayne and Laura and will be performing a special set of solo and duo pieces for OPEN Ealing. 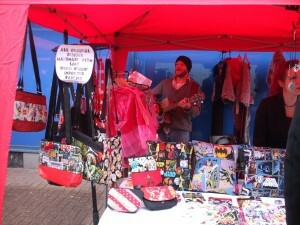 The next West Ealing Craft Market is in St James Avenue on Saturday 2nd June – the Jubilee weekend. With a bit of luck it may even be sunny! It would be good fun to have some live music and other street performers involved to make a bit of a special occasion. If you’re interested in volunteering to play or perform between 11am and 3pm do please email us at westealingneighbours@gmail.com . At the very least I’m sure we can supply you with something to eat and drink. As we get the market established we’re keen to make music and street performance a regular feature of the market so even if you can’t make it in June do still please email us. 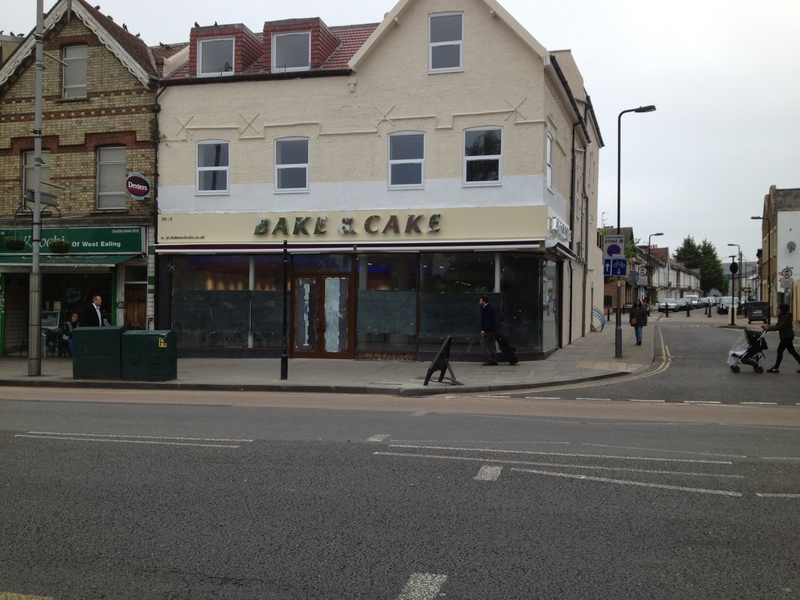 Walking along the Uxbridge Road this morning I spotted two new shops about to open. Bake & Cake near Cudi and Roosters Piri Piri opposite Blockbuster. I’m not sure when they’ll open so if anyone gets the opportunity to have a closer look then let me know. 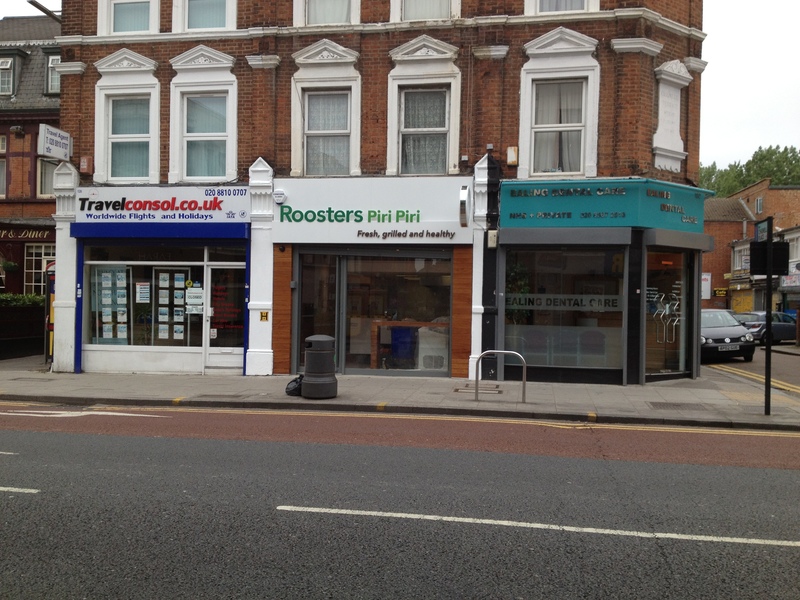 It’s nice to actually see a ‘healthy’ chicken place open amongst all the fried in West Ealing! A healthy alternative to fried chicken? As a long-time Blues music fan I’m delighted at the revival of The Ealing Club. The team there have worked so hard to get live blues music back at the home of British Blues Music. 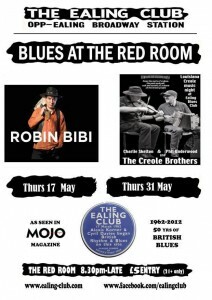 The Ealing Club is still in its original home, now called The Red Room, and is putting on regular music sessions. Louisiana Cajun and Zydeco music arrives to the heart of Ealing with the Creole Brothers. DuBellows and Blushing Bones recently appeared at OPEN Ealing so I can recommend them. Go to the Ealing Club website for more information and to buy tickets. 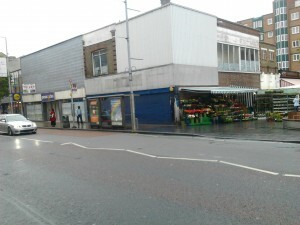 The possible development site on the corner of the Uxbridge Road and Melbourne Avenue - on a dull and rainy day! I’ve been trying to find out what’s happening to the now empty Peacock’s store and am told there have been holes drilled down in to the ground to look at the foundations. The view is that it’s testing the strength of the building for building flats above. I’m also told the owner of the store now also owns the empty store next door on the corner of Uxbridge Road and Melbourne Ave. So, expect to see plans for a redevelopment of this whole corner before long. Anyway, during my efforts to find out all this I got talking to a guy who cleans many shop windows in West Ealing and who I’ve seen about for years. He was telling me that more and more shops in West Ealing, and mostly those that are part of a chain, are stopping using his services and taking out central contracts with national companies. All of which means the money that was going in to the local economy is now going out of it. It may only be one small example but multiply it for other services that shops and offices need and you start to build up to a significant amount of money that could be spent locally but looks gradually to be going out of the area. I don’t pretend to know how to stop this but it just struck me again that all of us who live locally need to be aware of the importance of thinking carefully how and where we spend our money. A conscious decision to use local shops and services could be a key factor in whether or not these businesses survive and people keep their jobs. 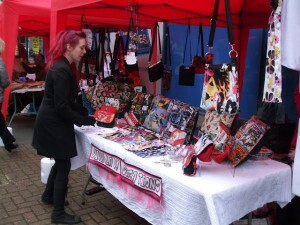 It may have rained but craft market stallholders’ spirits were high! Music in May – Steven Boyle playing under shelter! Our second craft market last Saturday was a bit damp with the rain but the general feeling from stallholders was that more people were buying this time. It will take time for people to know the market is there in St James Ave on the first Saturday of the month but there feels to be a gathering momentum and a lot of good will. We had some music and that went down well. I think we need to investigate whether we can get some modest amplification for future music. We’ll see if we can get more musicians for our next market on 2nd June which is Diamond Jubilee holiday weekend. Saturday (5th May) is the next monthly craft market in West Ealing. The market will be in St James Ave from 10am – 3pm and will have a range of stalls from cosmetics, candles and jewellery to wood turning, toys and leather goods. 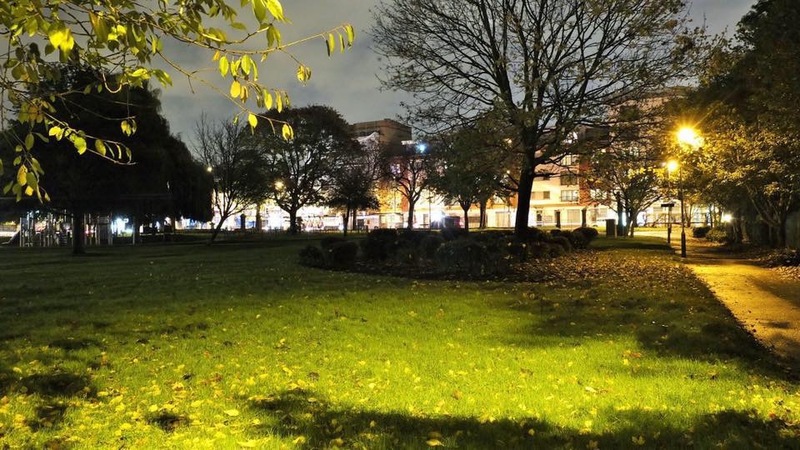 This time we also have some music at lunchtime with Greenford musician Steven Boyle playing his own songs and some favourites from down the years from 12.45-1.45 and WEN committee member Gill Adams playing folk with some friends from 2-3pm. As before, St James Church will have a stall offering free teas and coffees. Do please come along and support us and enjoy some free music. Friday 4th May sees OPEN Ealing’s next regular First Friday music event venture in to the world of Broadway musicals. May’s free concert at lunchtime from 12.30-1.30 will see OPEN host 3rd year music students from the University of West London playing excerpts from their forthcoming production of Kander and Ebb’s Flora the Red Menace. Best known for writing the hugely successful musical Cabaret, Flora the Red Menace was the songwriting team of John Kander and Fred Ebb’s first Broadway musical. There will also be an exhibition of artwork from local art group 4020 on display. Details at www.openealing.com. OPEN Ealing is at 113 Uxbridge Rd W5, opposite the fire station.